Aren’t they pretty? Those gorgeous white, star-shaped flowers. Great in the garden, great in a vase, great in your food, in your hair and give them to miss Dracula and she’ll be charmed into her own death. Mwhoahahaa... Meet garlic chives and their wonderful edible flowers. Right, it looks like an onion chive but it tastes like garlic, although it belongs to the onion family. Nature’s inventions are all here to please us. Its scientific name of Allium tuberosum is indicative of its oniony roots and it falls into the family of Liliaceae. Unlike onions or other types of garlic, however, the fibrous bulb is not edible and this plant is grown for its flowers and stems. They are also often referred to as Chinese chives and were first recorded between 4,000-5,000 years ago in China. You might wonder why garlic chives are not as commonly grown as regular chives (Allium schoenoprasum). We don’t know, but we hope that this article will help to raise the profile of garlic chives and let people know how wonderful they are, so that everyone, including you, starts growing them. Garlic chives are a hardy perennial and just as easy to grow as the normal chive. Like regular chives they spread quickly and can sometimes become too much of a good thing. But if you develop a taste for them, you can sprinkle garlic chives over almost any meal in great abundance, and stop them from taking over the whole garden. It is easy to differentiate between onion chives and garlic chives. Garlic chives have a flat, grass-like leaf, not a hollow one, like onion chives. Garlic chives flower towards the end of the summer. The florets of garlic chives are petite, white and star-shaped, appearing in loose bunches. And the flavor is more garlicky than oniony, though it is not as harsh as a raw clove of real garlic. You might say it has just that sublime subtlety that makes your taste buds tingle. Of course, its ornamental properties are truly sublime, and it also attracts butterflies. Yes, you read correctly. They attract butterflies. Need any more reasons to start growing? Well, here are some more. Since ancient times, garlic chives have been consumed in many ways, including as a natural medicine. And no wonder. The herb is rich in Vitamin C, which aids the prevention of the common cold and fever. It is rich in riboflavin, potassium, vitamin A, iron, thiamin, and beta-carotene. It is a good tonic herb to take regularly. These elements help to increase blood cell counts, maintain blood pressure, and increase immunity. It is low in fat, thus is safe for those who suffer from obesity. The herb has high percentage of dietary fiber and protein and helps to maintain a healthy and balanced metabolism. Cooked garlic chives help to treat digestive, kidney, and liver problems. Garlic chives are consumed to reduce stress and fatigue. Do you have enemies who are always trying to poison you? Well, garlic chives have been used since ancient days as an antidote to poisons that are injected into the body. And surprisingly, a paste of the herb is used on wounds, and cuts. It heals them faster and stops bleeding. We are absolutely sure that everyone will want to know how to start growing wild garlic chives in their herb garden. So let’s start growing. Garlic chives grow between fifteen to eighteen inches high and make a lovely flower in a border or container plant, and they also work well in the herb garden. They can be planted along a path or as a dense ground cover. The small, star-shaped flowers are usually creamcolored and grow on sturdy stems in June. The flowers can be eaten or dried and made into floral arrangements. Garlic chives germinate from seeds. Sow the seeds into a pot. The soil temperature should be kept to room temperature for the first six weeks. Then, once the seeds start germinating, take them and plant them outdoors. These little perennials can be planted in full exposure to the sun and in rich, well-draining soil with a pH of 6.0. 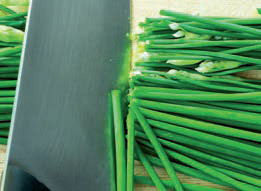 Chives are related to onions and will grow well with many of the same plants as their relative - namely beets, carrots, tomatoes, strawberries, potatoes, rhubarb, kohlrabi, parsley, broccoli, cabbage, eggplant, mustard and peppers, and are thought to enhance their flavors and growth intensity. Garlic chives discourage the spread of Japanese beetles, slugs, and cabbage worms, so place them where plants in full sunlight have a problem with these insect infestations. Garlic chives also repel aphids, which are known to be a problem for grapes; so planting these two in the same area is a good idea. 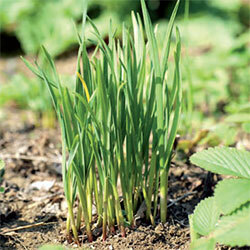 Avoid putting garlic chives near asparagus, peas, spinach and beans, as they will compete for similar soil nutrients. Looking after garlic chives is pretty straightforward. Water when needed. Although these plants are drought tolerant, they do enjoy moist soil around their roots. Other tips for looking after garlic chives include fertilizing them at the start of the growing season with a slow release fertilizer. After a long spell of freezing temperatures, garlic chives will often die back and return again come springtime. Clip the stems either all the way to the ground or with 2 inches remaining to allow the herb to grow anew. Garlic chives are essential in Asian culinary. However, in Asian countries people only use the fresh garlic chive leaves, which are usually fried with meat and vegetables. In Japan, garlic chives are a staple in Miso soup. The little garlic chives bulbs can also be used in the same way as you use garlic, particularly in dishes that require a more subtle flavour than regular garlic. 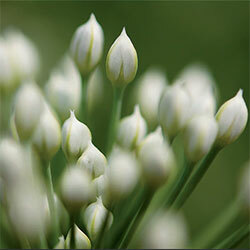 The flower buds of garlic chives can be eaten in the same way as those of onion chives. The flowering stems can also be used to season dishes. We like to keep things simple. In this ultra simple recipe, it’s the garlic chives that shine like the bright little stars they are. Do overindulge. Heat the wok over high heat until a drop of water vaporizes instantly upon contact. Add oil and swirl to coat the wok evenly. Heat until hot and just smoking. Add chives and red pepper flakes and stir-fry, letting chives rest on bottom and sides of wok several seconds between stirs, until chives are tender and slightly browned, 2 to 4 minutes. Stir in salt. Serve over rice. Sprinkle with flowers and put the last flower in your hair, you flower-child you. Enjoy!